The former Everton starman had a season to forget with series of injuries and match rusts so much so that Antonio Conte lost trust in him, giving him less than 6 appearances in all competition for the blues. The English man however showed the world what he is capable of, taking up the playmaker role, giving out final passed and making the Perth defenders very uncomfortable in the final third. 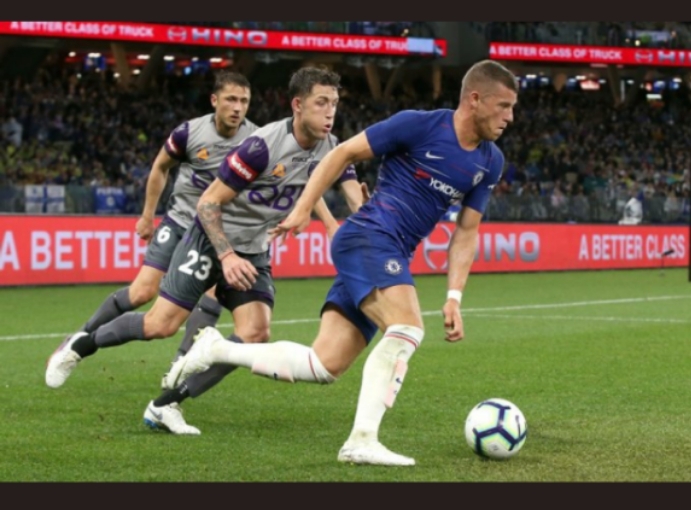 He created a good number of chances including one on the plate for the out of form Alvaro Morata which he squandered as usual. Given a good chance, Barkley can once again be a force to reckon with just like he used to be years back. Sarri in his post match conference didn’t hesitate to voice out his pleasure with the first 60 minutes and displeasure with the last 30 minutes. The difference here was the crop of players that featured in those periods. The likes of Mario Pasalic, Lucas Piason, Ola Aina, Tomas Kalas and Tammy Abraham came on in the latter part of the game and this witnessed a drastic disruption in the free flowing fluid style. Timoue Bakayoko struggled a lot like he did all through last season and the whole team looked a bit disorganized. Tammy Abraham was a bit lively and dogged as he gave a considerably good account of himself, so much unlike the rest. Another term on the road will be more appropriate for most of these lads. The 75 million pounds former Real Madrid man was tipped for success by a lot of people and he started really well, getting a goal on his debut and going on to get a lot of impressive performances with his aerial potency and sharp body movement. This however dropped in the turn of the new year as he struggled for form on the back of a muscle injury. He later became a bit unpopular as he lost the sharpness and the finesse that he was admired for. This ultimately cost him a world cup place with the Spanish national team as Valencia’s Rodrigo, Atleti’s Diego Costa and Celta vigo’s Iago Aspas were the out and out strikers preferred. The loyal blues would have hoped that he would be able to take advantage of his early holiday to come back fresher and sharper but unfortunately, he looks more like a worse off option up front. The pursuit of a new front man should take a more serious force as this will be badly needed, with deputy Mitchy Batshuayi likely to return to BVB Dortmund on another loan spell. All in all, Chelsea Football Club’s supporters can have a breath of hope as the future looks pretty good. The transfer window has a little above 2 weeks more and time is not on the board’s side to get their targets with Allison and Golovin already off their grips as they have been captured by Liverpool and Monaco respectively. A few additions in some key positions and a strong approach to keep their star men will make a huge difference and most likely deliver the much coveted fluid football to the blues, probably adding some silverwares to it.